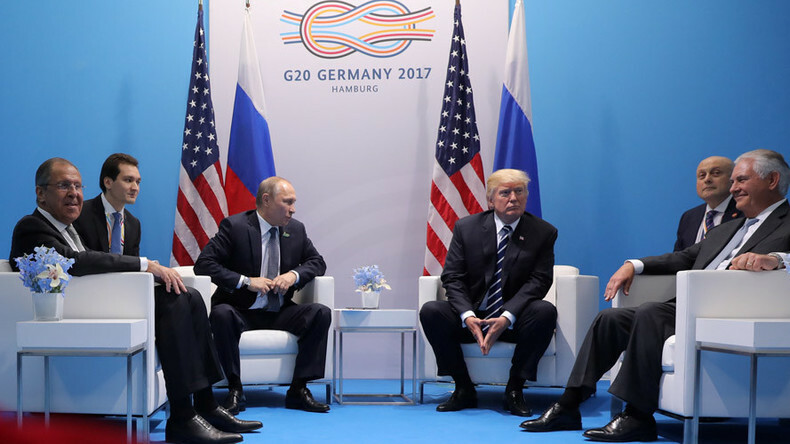 US President Donald Trump said that his meeting with Russian President Vladimir Putin on Friday was “tremendous.” The first face-to-face meeting between the two leaders lasted for more than two hours on the sidelines of the G20 summit in Hamburg. “I had a tremendous meeting yesterday with President Putin,” Trump said while speaking with UK Prime Minister Theresa May on Saturday. With Prime Minister May at his side, Trump says he had "tremendous meeting yesterday with President Putin." He says he will visit U.K.
Putin and Trump met for more than two hours, instead of the planned 30-40 minutes. The leaders had “positive chemistry” and “connected quickly,” US Secretary of State Rex Tillerson said after the meeting on Friday. The US and Russian leaders were joined at the meeting by US Secretary of State Rex Tillerson and Russian Foreign Minister Sergey Lavrov. The leaders discussed many topics, including Ukraine, Syria, and cybersecurity and fighting terrorism, according to Putin, who spoke at a news conference later. After the meeting, US and Russian officials announced a ceasefire agreement in southwestern Syria, set to take effect on July 9. The ceasefire applies to the southern Daraa, Quneitra, and As-Suwayda provinces. “In this zone, the ceasefire regime will take effect on July 9 starting 12:00 Damascus time,” Russian Foreign Minister Sergey Lavrov said after the meeting between Trump and Putin. The presidents also agreed to create a bilateral channel to promote a settlement of the Ukrainian crisis, Lavrov said, adding that the Ukrainian crisis was discussed “in a concrete, businesslike” manner.